If you’re not behind on your mortgage payments but have been unable to get traditional refinancing because the value of your home has declined, you may be eligible to refinance through MHA’s Home Affordable Refinance Program (HARP). HARP is designed to help you get a new, more affordable, more stable mortgage. HARP refinance loans require a loan application and underwriting process, and refinance fees will apply. *Eligibility criteria are for guidance only. Contact your mortgage servicer to see if you are eligible for HARP. Best real estate year since 2008…so far so good! Our office (thanks Mike!) compiled some stats on the year to date sales transactions over the past few years and 2012 is off to the best start since 2008 from a sales (# of transactions) standpoint. Prices overall are down, from a dollar volume standpoint, but we are beating the national average of price decline. We aren’t quite back to the peak numbers of 2007, but we are getting better each year and selling some excess inventory. 88 sales year to date through April 2012 for a total dollar volume of $27,035,550 – easily our best year since 2008. Another interesting trend is the number of new listings is slowly decreasing – 104 fewer homes were on the market through April 2012 than this time last year. We’re gaining ground and selling more homes and that is a sign of a healthy real estate market! Railey Realty continues to be #1 in listing inventory and selection, and #1 in sales in Garrett County and Deep Creek Lake since 1995! Posted on May 30, 2012 Author ilovedeepcreeklakerealestateCategories UncategorizedLeave a comment on Best real estate year since 2008…so far so good! 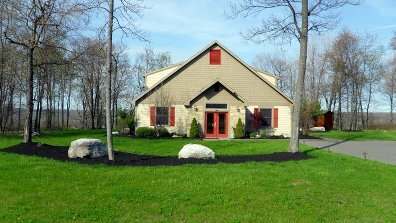 Vacation Rental – Ski & Glee – New Putt-Putt Golf Course! 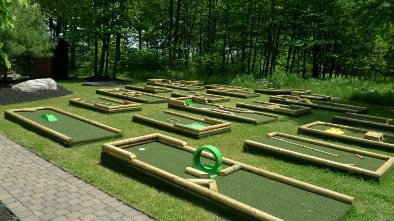 One of my clients just added a free putt-putt golf course to his already impressive vacation rental home near Wisp – Ski & Glee. It features an indoor pool, arcade, Xbox Kinect & full movie catalog, an outdoor sauna, horse shoe pit and many more amenities. Book your stay here! Visit Ski & Glee on Facebook here. Posted on May 30, 2012 Author ilovedeepcreeklakerealestateCategories ski and glee, vacation rentalsLeave a comment on Vacation Rental – Ski & Glee – New Putt-Putt Golf Course! WASHINGTON (May 30, 2012) – Pending home sales retrenched in April following three consecutive monthly gains, but are notably higher than a year ago, according to the National Association of Realtors®. The Pending Home Sales Index,* a forward-looking indicator based on contract signings, declined 5.5 percent to 95.5 from a downwardly revised 101.1 in March but is 14.4 percent above April 2011 when it was 83.5. The data reflects contracts but not closings. Lawrence Yun, NAR chief economist, said a one-month setback in light of many months of gains does not change the fundamentally improving housing market conditions. “Home contract activity has been above year-ago levels now for 12 consecutive months. The housing recovery momentum continues,” he said. The PHSI in the Northeast rose 0.9 percent to 78.9 in April and is 19.9 percent higher than April 2011. In the Midwest the index slipped 0.3 percent to 93.0 but is 23.0 percent above a year ago. Pending home sales in the South fell 6.8 percent to an index of 105.7 in April but are 13.3 percent higher than April 2011. In the West the index dropped 12.0 percent in April to 94.9 but is 5.1 percent above a year ago. The housing forecast has been upgraded, with existing-home sales expected to reach 4.66 million this year, compared with 4.26 million in 2011. The outlook for 2013 is now 4.92 million, but could vary significantly depending on two scenarios. If lending returns to normal, the 2013 outlook for existing-home sales would measurably improve to 5.3 million. However, a fiscal cliff scenario of higher taxes and sharp spending cuts beginning in early 2013, which is an unlikely event but still worth noting, would lower the sales projection to 4.5 million. Because of measurably lower inventory supplies, the forecast for home prices has been upwardly revised with the median existing-home price projected to rise 2 to 3 percent this year and 4 to 5 percent in 2013, with wide local market variations. Miami and Phoenix will easily achieve double-digit price growth by year end. Yun said the price gains will measurably reduce the number of underwater homeowners. “For example, a 5 percent national price gain means the number of underwater homeowners would fall to about 9 million from current estimates of around 11 million. A 10 percent gain, say over the next two years, would reduce the underwater status to about 7 million households out of 75 million owner-occupied homes,” he said. About 25 million homes are owned free and clear without a mortgage. Though the proportion of distressed properties is still high, the numbers have been falling over the past two years. “The diminishing share of distressed properties is another reason for higher home prices in upcoming months,” Yun added. WASHINGTON (May 24, 2012) – Shaking off a prolonged impact from the recession, fundamentals are gradually improving in all of the major commercial real estate sectors, according to the National Association of Realtors® quarterly commercial real estate forecast. The apartment rental sector has fully recovered and is growing. The findings also are confirmed in NAR’s recent quarterly Commercial Real Estate Market Survey, which collects data from members about market activity. Rising apartment rents also are having a positive impact on home sales because many long-time renters now view homeownership as a better long-term option, Yun noted. NAR’s latest Commercial Real Estate Outlook1 offers projections for four major commercial sectors and analyzes quarterly data in the office, industrial, retail and multifamily markets. Historic data for metro areas were provided by REIS, Inc.,2 a source of commercial real estate performance information. Vacancy rates in the office sector are projected to fall from 16.3 percent in the second quarter of this year to 16.0 percent in the second quarter of 2013. The markets with the lowest office vacancy rates presently are Washington, D.C., with a vacancy rate of 9.3 percent; New York City, at 10.0 percent; and New Orleans, 12.6 percent. Office rents should increase 2.0 percent this year and 2.5 percent in 2013. Net absorption of office space in the U.S., which includes the leasing of new space coming on the market as well as space in existing properties, is forecast at 24.7 million square feet in 2012 and 48.0 million next year. Industrial vacancy rates are likely to decline from 11.0 percent in the current quarter to 10.7 percent in the second quarter of 2013. The areas with the lowest industrial vacancy rates currently are Orange County, Calif., with a vacancy rate of 4.7 percent; Los Angeles, 5.0 percent; and Miami at 7.2 percent. Annual industrial rent is expected to rise 1.6 percent in 2012 and 2.4 percent next year. Net absorption of industrial space nationally is seen at 44.1 million square feet this year and 62.4 million in 2013. Retail vacancy rates are forecast to decline from 11.3 percent in the second quarter to 10.7 percent in the second quarter of 2013. Presently, markets with the lowest retail vacancy rates include San Francisco, 3.7 percent; Fairfield County, Conn., at 4.0 percent; and Long Island, N.Y., at 5.0 percent. Average retail rent should rise 0.8 percent this year and 1.3 percent in 2013. Net absorption of retail space is projected at 8.0 million square feet this year and 21.9 million in 2013. The apartment rental market – multifamily housing – is likely to see vacancy rates drop from 4.5 percent in the second quarter to 4.3 percent in the second quarter of 2013; apartment vacancy rates below 5 percent generally are considered a landlord’s market with demand justifying higher rents. Areas with the lowest multifamily vacancy rates currently are New York City, 2.1 percent; Portland, Ore., at 2.3 percent; and Minneapolis at 2.4 percent. Multifamily net absorption is forecast at 215,900 units this year and 230,300 in 2013. Approximately 78,000 NAR and institute affiliate members specialize in commercial brokerage and related services, and an additional 232,000 members offer commercial real estate services as a secondary business. According to Freddie Mac, the national average commitment rate for a 30-year, conventional, fixed-rate mortgage declined to 3.91 percent in April from 3.95 percent in March; the rate was 4.84 percent in April 2011. Last week the 30-year fixed rate dropped to a record weekly low of 3.79 percent; record keeping began in 1971. About 16 million homeowners owe more on their mortgage than their homes are worth, which means they are “underwater.” So long as that condition continues, they have no equity that can be used to help finance the purchase of another house. On the contrary, they can’t sell the house without digging into their pockets to pay the difference between what they owe and what they can realize from the sale net of expenses. But time heals most wounds, and negative equity is no exception. The principal component of the monthly mortgage payment reduces the loan balance by the same amount. Refinancing into a mortgage carrying a lower interest rate reduces the interest portion of the monthly mortgage payment, thereby increasing the principal component and the rate at which the balance is paid down. Although underwater borrowers generally can’t qualify for a refinance, those fortunate enough to have their mortgages held by Fannie Mae or Freddie Mac comprise an important exception. The government’s Home Affordable Refinance Program (HARP) permits negative equity, though borrowers must be in good standing to be eligible. Posted on May 30, 2012 Author ilovedeepcreeklakerealestateCategories underwater borrowersLeave a comment on How long will you be underwater? — CUMBERLAND — People who are interested in PlanMaryland are invited to two workshops to discuss incorporating the economic development interests of Western Maryland into the first state development plan. The Sustainable Transformation of the Appalachian Region Project, in partnership with The Greater Cumberland Committee, the National Center for Smart Growth and the University of Maryland Extension, will host the workshops. The first workshop is scheduled for Thursday at the Will O’ The Wisp Restaurant in McHenry; the second workshop will be held June 4 at the Cumberland Country Club. Both workshops will run from 10 a.m. to 2 p.m. with lunch provided. Gerrit Knapp, University of Maryland Extension, and Jason Sartori, Integrated Planning Consultants, will serve as facilitators. Through funding made possible by the Appalachian Regional Commission, the primary objective of the STAR project team is to prepare a primer for economic development planning for Western Maryland. The workshops are sponsored with no charge to the general public by TGCC, University of Maryland Extension, Garrett County Department of Economic Development and Chamber of Commerce, and the Western Maryland Health System. Reservations should be made by Wednesday by contacting Juli McCoy at 301-722-0090 or jmccoy@greatercc.org. The STAR website, http://smartgrowth.umd.edu/starproject.html, contains data that will help facilitate workshop discussions. — OAKLAND — Resident Michael McGuire recently donated two pet oxygen mask kits to the Oakland Volunteer Fire Department. McGuire, who works in anesthesia, donated the masks after seeing a photo in the newspaper of a firefighter resuscitating a dog with an oxygen mask made for a person. McGuire purchased his mask from Wag’N Enterprises because he liked the fact that the masks came with special storage bags and decals. “The decals make it easy for firefighters to determine which fire truck has the pet masks,” said McGuire. In the future, McGuire plans on donating a mask to the Garrett County Sheriff’s Office for its K-9 unit, in case they ever get injured in the line of duty. Pet oxygen masks are specially designed to fit the snouts of different sized animals as small as a ferret to as large as a foal. The masks are sold by Wag’N Enterprises through the O2 Fur Life initiative (www.wagnpetsafety.com), which has the goal of ensuring all first-responders in North America carry them. So far, Wag’N has placed masks in more than 1,200 departments in the U.S. and Canada. In 2010, the Regional Education Service Agency 8 purchased 22 pet masks for Mineral, Grant, Hampshire and Hardy and other numerous counties in West Virginia, according to a Wag’N 02 Fur Life list of supporters.